You often see ads for two-way radios saying "up to 36 miles" or more. If you search for reviews on these same radios, you will find many disappointed people saying they can't get anywhere close to the advertised range. The key words in the advertisement are "up to". This maximum range is more theoretical than realistic. So how far can you really expect to talk? "How far can this radio talk?" is one of the most common questions people ask when buying a two-way radio. Unfortunately there isn't a quick answer. That's because the type of equipment and terrain can greatly affect your range. The key considerations that affect range are: signal type, antenna, obstructions, and signal strength (wattage). No single factor is a silver-bullet to extend your communication range. But taken in combination, they can mean the difference between getting 1/2 mile range, vs 6 miles or more. Let's discuss each of these. First, not all radio signals are the same. They differ in how they travel, and how they react when they encounter materials. Frequencies below 2MHz (Megahertz) are reflected off the atmosphere, thus they can follow the Earth's curvature. So these low frequency signals can sometimes be received by radios below the horizon hundreds of miles away. As a general rule, the lower the frequency, the greater distance it can travel. CB radios, and some HAM frequencies, are in the HF (High Frequency) range of 29-54MHz, giving them some of these qualities. BUT, low frequencies are susceptible to some other issues. Most two-way radios used today have a frequency range somewhere within 130MHz to 900MHz (except CB & Ham radios). The two most commonly used frequency ranges for two-way radios are VHF (Very High Frequency 130-174MHz), and UHF (Ultra High Frequency 400-520MHz). Unlike frequencies below 2MHz, radio waves in these higher frequencies travel in straight lines (called "line-of-sight" signals), and generally cannot travel beyond the horizon. So the distance to the horizon is the maximum communication range for these two way radios, without the aide of additional equipment to "boost" the signal. But it doesn't end here, there are other considerations we need to explain. VHF vs UHF Which is Better? The two frequency ranges (also called "frequency bands") used in most two-way radios are VHF (Very High Frequency), and UHF (Ultra High Frequency). We are often asked "Is VHF or UHF better?" Neither is inherently better, they each have strong points and weaknesses. VHF frequencies can penetrate objects better than UHF. VHF can also travel farther. 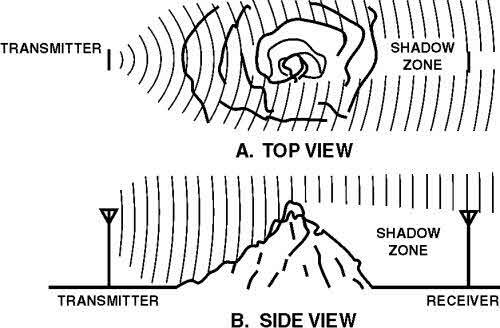 If a VHF wave and a UHF wave were transmitted over an area without barriers, the VHF wave would travel almost twice as far. "Sign me up for VHF!" you say. Not so fast. Even though VHF can pass through obstacles better and travel farther, that doesn’t mean it's always the better choice. "Why?" you ask. It's because of the difference between how VHF vs UHF signals react around structures. Remember, UHF signals are shorter than VHF, this is important when you're in or around buildings. To explain this let’s take an example. Assume you are trying to communicate from one side of a commercial building to the other. In between is a metal wall with a three-foot opening. Radio waves can not pass through metal. The UHF wavelength is roughly one and a half feet wide, the VHF wavelength is roughly five feet wide. The UHF signal (1 1/2 ft) passes through the door easily. However, the VHF signal is reflected since it is wider than the door. As you can see, UHF is better at navigating through the smaller spaces within a building to reach it's destination. VHF signals are often blocked by metal within the building. So to sum it up, it's a trade-off. But the general rule-of-thumb is if you are using the radio primarily outdoors where you will have clear line-of-sight then VHF is a better choice because it's signal will travel farther. BUT, if you will be using your radio in or around buildings, in urban areas, or heavily wooded areas, then UHF is a better choice because it's signal will navigate around structures better, not being blocked as easily as VHF. The trade-off you are making is longer distance (VHF), vs avoiding possible "dead spots" in and around structures (UHF). One of the easiest ways to extend your range is by focusing on your antenna. When we said "the distance to the horizon is the maximum communication range" we didn't mention one key factor, your antenna. The calculation of distances is based on the height of your antenna. In other words, the exact distance to the horizon varies depending on your antenna height. There is a formula for calculating distance to the horizon based on height, but it's a little technical (see section below "Calculating the Horizon"). For now, let's just leave it at a simple rule-of-thumb: a 6ft high antenna at both ends of the transmission (transmit & receive), will have a maximum range of approximately 6 miles. So according to our rule-of-thumb, 2 people around 6 feet tall using a 5 watt handheld two-way radio, used on flat ground with no obstacles, will have a maximum range of approximately 6 miles. Are you guaranteed to get 6 miles? No. You may only get 4 miles or even less. What can you do to make it more like 6 miles than 4 miles? Use a better antenna! Not all antennas on handheld radios are the same. 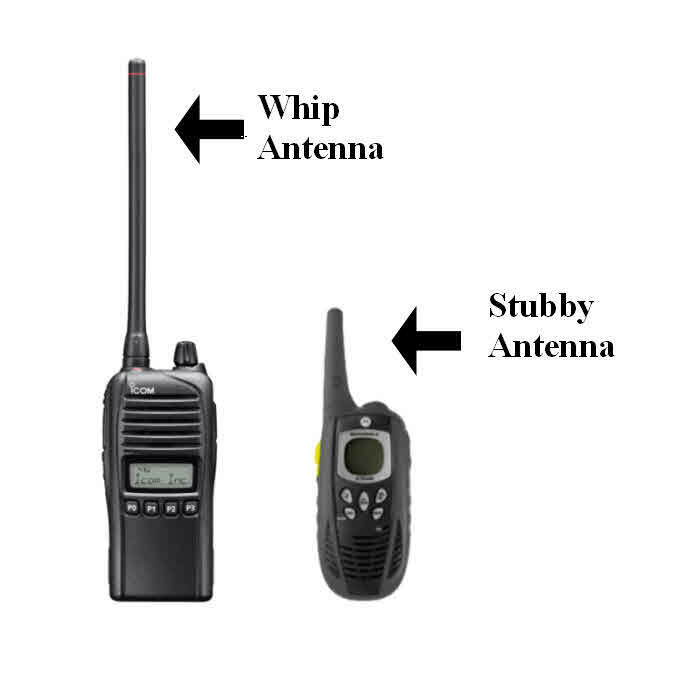 Handheld radios have 2 common types of antennas: stubby and whip. Many FRS/GMRS radios on the market today have a stubby antenna because it's easier to put your radio in a backpack or pocket. However, stubby antennas can reduce your range by up to 30% over a whip antenna. So if range is important to you, look for a radio with a whip antenna, or at the very least, one where you can remove the stubby antenna and replace it with a whip antenna. But keep reading, there are other things to consider as well, such as power and obstructions. Antennas on cars are usually mounted on the roof or trunk and can extend several feet above the car. Therefore, mobile radios can often communicate within a range of 10 - 30 miles. Antennas on boats are much the same. But marine radios have a big advantage, there are no obstacles on the open water! Aviation radios in the air have the most advantage, no obstacles and you're already very high! Base station antennas are located on the roof of a building, and commercial broadcast antennas are usually located on mountain tops or very high towers. For example, a 25-watt marine radio will roughly have a maximum range of 60 nautical miles (111 km) between antennas mounted on tall ships, but that same radio will only have a range of 5 nautical miles (9 km) between antennas mounted on small boats at sea level. Both ships have the same 25-watt radio, the difference in this example is the height of the antenna. From the air it gets even better. Most airband radios are 5 - 8 watts and typically have a range of around 200 miles. See what a difference antenna height can make? In fact, when trying to increase your range, increasing your antenna height is a more effective way to extend your range than increasing your power, you get more bang for your buck (so to speak). To sum it up, the higher your antenna the longer your communication range. For mounted antennas, it's important to mount your antenna on the highest point possible. Also, mount your antenna in a straight-up position, not at an angle. For handheld radios, instead of a stubby antenna, get a whip antenna to maximize your range. Remember we said you might only get 4 miles range or less? Radios signals are sometimes blocked by solid objects. Metal is not your friend when it comes to radio communications. Radio waves generally won't pass through it. Ever wonder why microwaves don't pass through the glass door? Did you notice the glass door has a metal mesh with very small holes? Microwaves are extremely high frequency with small signal waves. Although microwaves are small, they are still bigger than the tiny holes in the metal mesh. The metal mesh keeps the microwaves from passing outside the oven. Another consideration is hills. If you live in an area with hills, they are like metal, no radio signal will pass through them. BUT, radio signals can travel through many non-metallic objects such as drywall, masonry, human bodies, furniture, and many other objects. However, each time a radio signal passes through an object the signal strength is reduced. Also, the denser an object, the more it reduces the signal strength. So with each successive object a signal passes through, it's range is shortened. Another important factor in determining the distance a radio can communicate is it's signal strength. The stronger the signal strength, the more it can withstand weakening when it passes through obstacles. Signal strength is mainly a result of a radios' power output, measured in watts. Commercial radio stations typically broadcast at 50,000 or 100,000 watts. Compare that to a handheld two-way radio which uses between 1/2 - 5 watts. You can see there is a big difference. Unlicensed radios such as: FRS radios are limited to 1/2 watt, MURS 2 watts, CB radios 4 watts, SSB radios can have 12 watts. Other handheld radios such as marine, aviation, and licensed land-based radios such as: LMR, Ham, & GRMS are limited to 5 watts. The maximum wattage for each radio type is set by the FCC. Moreover, handheld radios run off a small battery, so a higher wattage would mean your batteries will not last very long. Mobile radios usually broadcast from 25 to 100 watts maximum. Installed in vehicles, they run off the vehicle's battery. Their signal is much stronger than a handheld radio, therefore less affected by obstacles. However, their signal can still only travel to the horizon. So just having more watts without a better antenna is like having a large funnel with a small hole. So mount your antenna as high-up on your vehicle as possible. Remember the higher your antenna the father the horizon is. So more watts, along with a better antenna, equals longer range. To sum it up, the more watts a radio has, the stronger the signal. A stronger signal is capable of withstanding successive passes through obstacles, allowing it to travel farther. * These are averages. Assumes standard equipment. Antenna type can have a significant effect on range. If you are at the edge of your communication range and your signal is weak, open up the 'Monitor' function on your radio to listen for weak signals. One of the easiest ways to increase your range is to increase your height. If you are near the edge of your range and experiencing a weak signal try getting to a higher location. Walk up a hill, or simply stand on something to make yourself taller if possible. Remember, just a foot or two can make a big difference in range. If you are using an FRS / GMRS radio, switch to the GMRS channels. The FCC (Federal Communications Commission) limits FRS channels to 1/2 watt of power, GMRS can have up to 5 watts of power. FRS-only channels are 8 - 14, GMRS channels are 15 - 22 exclusively, and channels 1 - 7 are both FRS and GMRS. Most commercial VHF and UHF radios have two or more power modes. Be sure your radio is set to the high power mode. Use a whip antenna instead of a stubby one. On vehicles, mount your antenna as high as possible in a vertical position. Make sure your battery is fully charged. Radio signals weaken when their battery is low. If range is critical then opt for a mobile radio. Mobile radios can have 3 to 4 times the range of a handheld radio. Install a repeater. Repeaters receive signals and "re-broadcast" them, relaying them to a farther destination. However, installing a repeater is more complex. One alternative is to find a repeater service in your area. These services usually charge a monthly fee. Rfinder.net is an online worldwide directory of repeaters ($10 yearly fee). You can use this application to locate nearby repeaters, it also has an iPhone app. Fortunately, for most applications, a repeater is not necessary and a VHF or UHF radio alone will do just fine. Remember at the beginning we discussed the claims some radio brands make of "up to 36 miles" or more communication range? How can they make such a claim? Well in reality, what they are saying, is "if the horizon is not a factor, say you are on top of a mountain, and there are no obstructions (clear line-of-sight), then there is enough signal strength for the signal to carry for 36 miles. How often are you on top of a mountain? One last thing we didn't mention is the weather, and other atmospheric conditions can affect radio transmissions. But since there isn't much you can do about mother nature, we will only give it a passing mention here. If you really need to know about the effects of weather on radio transmission then that's a whole other conversation. The key factors affecting communication range are: antenna, obstructions, signal strength (wattage), and signal type. The distance to the horizon is the maximum communication range for most two-way radios. The higher your antenna, the farther your signal can reach before hitting the horizon, therefore the longer your communication range. For mounted antennas, mount your antenna standing straight-up on the highest point possible. For handheld radios, instead of a stubby antenna, get a whip antenna. Radio waves generally won't pass through metal or hills at all. Each successive object a radio signal passes through reduces its range. A stronger signal is capable of withstanding successive passes through obstacles, allowing it to travel farther. Either VHF or UHF radio technology can work for you if you don’t really have a long range to cover. If you are using the radio primarily outdoors with clear line-of-sight, then VHF is a better choice because it's signal will travel farther. If you are using the radio in or around buildings, in urban areas, or heavily wooded areas, then UHF is a better choice because it's signal will navigate around obstacles better. If you must have a longer range than most radios can provide, then consider either buying a repeater or contact a repeater service. The higher your antenna, the farther the horizon. For any given antenna height use this formula: Horizon at Ground Level (in kilometers) = 3.569 multiply by the square root of the Antenna Height (in meters). So if the antenna height is at 6 feet tall (1.82880 meters), times the horizon (3.569), equals 4.83 kilometers, or 2.99 miles away. However, the example above assumes the receiving antenna is on the ground. Raising the receiving antenna's height would extend the line-of-site even more. So if the receiving antenna were also 6 feet off the ground you should be able to communicate almost 6 miles without obstructions (2.99 miles + 2.99 miles). Thus, two people carrying a handheld two-way radio, the maximum communication distance on flat ground with no obstructions is approximately 6 miles. Battery Basics - How to maintain your battery for longer life. Using VHF Marine Radios - Overview of how to use marine radios, list of all marine channels and frequencies. Helpful tips.